Eleven containers are still unaccounted for. A ship container that was once loaded with bread washed ashore on San Francisco's Baker Beach, where crews were busy on Monday trying to clean up the mess. The National Park Service said beach cleanup will last throughout the day on Monday, and the shipping company, Oakland-based Matson, is responsible for it. The beach will be closed throughout the cleanup. A total of 12 containers fell off a container ship called the Manoa late Friday in rough seas, according to the US Coast Guard, and only one so far has landed ashore. Eleven container ships are still unaccounted for. Beachgoers snapped photos of green crates that once held the bread and hundreds of Matson boxes scattered all over the sand and water. In a tweet, the park service said there was no hazardous materials inside, but the debris was "messy." Styrofoam containers were also strewn about. It seems as if most, perhaps all of the bread, was still floating out at sea and did not end up on the beach. A ship container that was once loaded with bread washed ashore on San Francisco's Baker Beach, where crews were busy on Monday trying to clean up the mess. The National Park Service said beach cleanup will last throughout the day on Monday, and the shipping company, Oakland-based Matson, is responsible for it. The beach will be closed throughout the cleanup. Stephanie Chuang reports. Tim Parker of Parker Diving Service, who was hired by Matson, said he thinks he can clean up all 1,000 crates by the end of the day, but will have to return on Tuesday for "foam cleanup." He said a refrigerated container broke off a ship and washed up on China Beach, which then broke into smaller pieces and found their way to Baker Beach, both of which are in San Francisco. "Nobody was injured," he said. "It was a miracle." 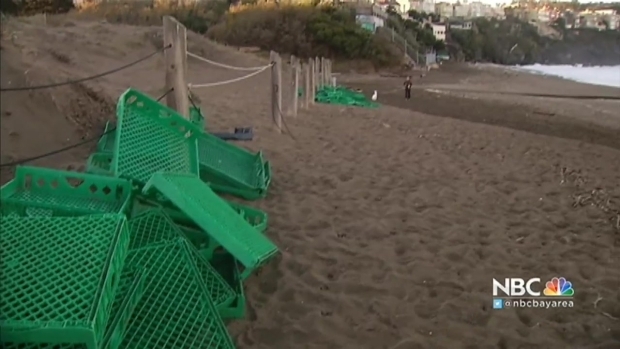 Drew McLaughlin was at Baker Beach, documenting the trashed beach with photos and video. So was Wendy Stovell of San Francisco, who came out to pick up as much trash herself as she could. "The Styrofoam down on the other end of the beach," she said, "is out of control." She said it's really impossible to pick up all the mess by hand. "I tried," she said. "There's too much of it."